The Great Roman Civil War (49–45 BC), also known as Caesar's Civil War, was one of the last politico-military conflicts in the Roman Republic before the establishment of the Roman Empire. It began as a series of political and military confrontations, between Julius Caesar (100–44 BC), his political supporters (Populares), and his legions, against the Optimates (Boni), the politically conservative and socially traditionalist faction of the Roman Senate, who were supported by Pompey (106–48 BC) and his legions. After a five-year-long (49–45 BC) politico-military struggle, fought in Italy, Illyria, Greece, Egypt, Africa, and Hispania, Caesar defeated the last of the Optimates in the Battle of Munda and became Dictator perpetuo (Perpetual Dictator) of Rome. The changes to Roman government concomitant to the war mostly eliminated the political traditions of the Roman Republic (509–27 BC) and led to the Roman Empire (27 BC–AD 476). At Brundisium, Caesar assembled an army of some 15,000 soldiers, and crossed the Strait of Otranto to Palaesta in Epirus (Palase/Dhermi, Albania). In that time, Pompey considered three courses of action: (i) alliance with the King of Parthia, an erstwhile ally, far to the east; (ii) invade Italy with his naval superiority; and (iii) confronting Julius Caesar in decisive battle. A Parthian alliance was unfeasible, a Roman general fighting Roman legions with foreign troops was craven; and the military risk of an Italian invasion was politically unsavoury, because, the Italians (who thirty years earlier had rebelled against Rome) might rise against him; thus, on councilor's advice, Pompey decided to fight Julius Caesar in decisive battle. Moreover, Caesar's pursuing him to Illyrium, across the Adriatic Sea, decided the matter, and, on 10 July 48 BC, Pompey fought him in the Battle of Dyrrhachium, costing Caesar 1,000 veteran legionaries and a retreat. 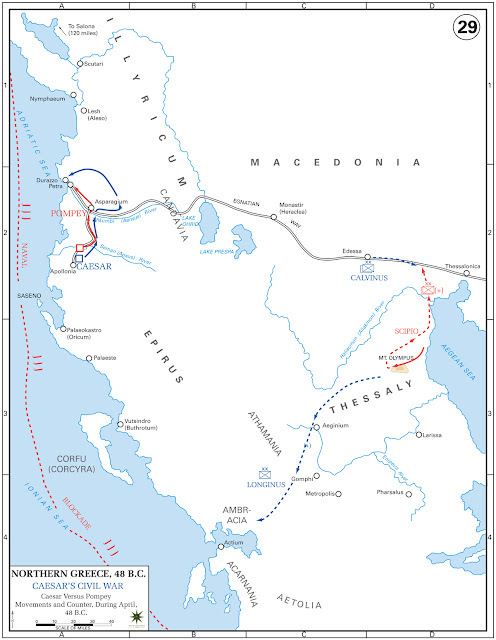 Disbelieving that his army had bested Caesar's legions, Pompey misinterpreted the retreat as a feint to a trap, and refused to give chase for the decisive, definitivecoup de grâce, thus losing the initiative, and the chance to quickly conclude Caesar's Civil War; meanwhile, Caesar retreated southwards. Near Pharsalus, Caesar pitched a strategic bivouac, and Pompey attacked, yet, despite his much larger army, was conclusively defeated by Caesar's troops. A major reason for Pompey's defeat was a miscommunication among front cavalry horsemen. Pompey fled to Egypt, where he was murdered by an officer of King Ptolemy XIII. Caesar pursued the Pompeian army to Alexandria, where they camped and became involved with the Alexandrine civil war between Ptolemy and his sister, wife, and co-regnant queen, the Pharaoh Cleopatra VII. Perhaps as a result of Ptolemy's role in Pompey's murder, Caesar sided with Cleopatra; he is reported to have wept at the sight of Pompey's head, which was offered to him by Ptolemy's chamberlain Pothinus as a gift. 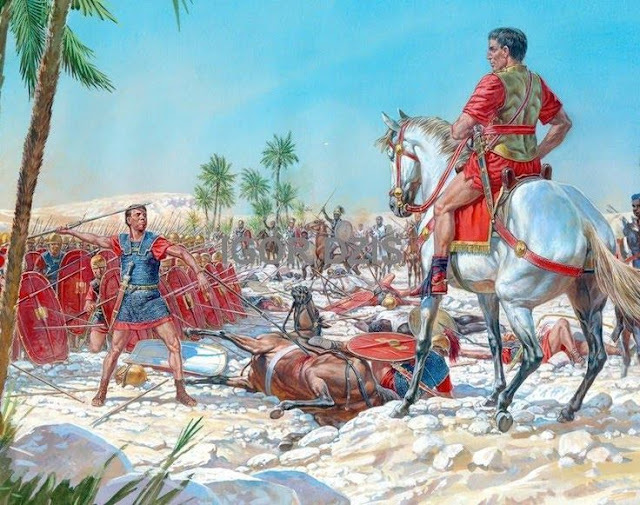 In any event, Caesar was besieged at Alexandria and after Mithridates relieved the city, Caesar defeated Ptolemy's army and installed Cleopatra as ruler, with whom he fathered his only known biological son, Ptolemy XV Caesar, better known as "Caesarion". Caesar and Cleopatra never married, due to Roman law that prohibited a marriage with a non-Roman citizen. After spending the first months of 47 BC in Egypt, he went to Syria, and then to Pontus to deal with Pharnaces II, a client king of Pompey's who had taken advantage of the Romans being distracted by their civil war to oppose the Roman-friendly Deiotarus and make himself the ruler of Colchis and lesser Armenia. At Nicopolis he had defeated what little Roman opposition Caesar's lieutenant, the governor of Asia Gnaeus Domitius Calvinus, could muster. He had also taken the city of Amisus, which was a Roman ally, sold the inhabitants to slave traders. After this show of strength against the Romans, Pharnaces drew back to suppress revolt in his new conquests. Nevertheless, the extremely rapid approach of Caesar in person forced Pharnaces to turn his attention back to the Romans. At first, recognizing the threat, he made offers of submission, with the sole object of gaining time until Caesar's attention fell elsewhere; Caesar's speed brought war quickly and battle took place near Zela (modern Zile in Turkey), where Pharnaces was routed with just a small detachment of cavalry. Caesar's victory was so swift and complete that, in a letter to a friend in Rome, he famously said of the short war, "Veni, vidi, vici" ("I came, I saw, I conquered"): indeed, for his Pontic triumph, that may well have been the label displayed above the spoils. 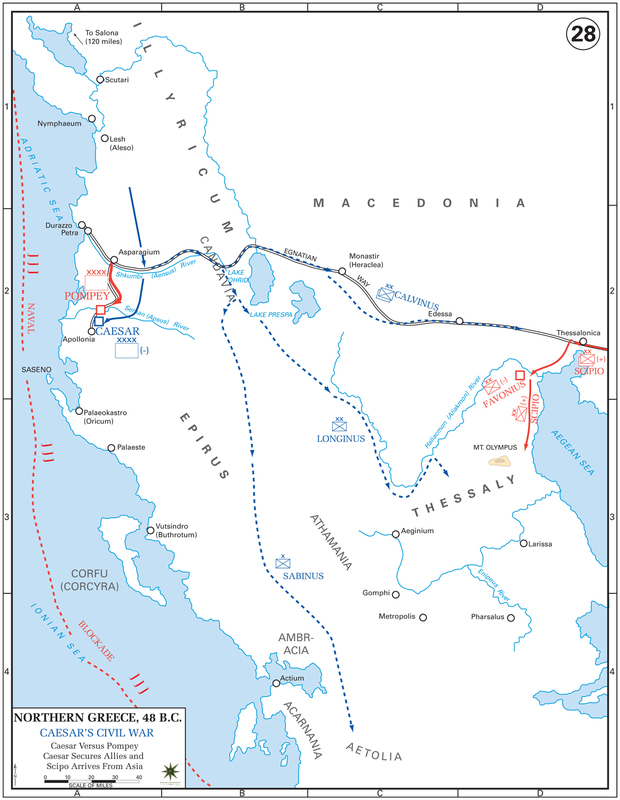 Pharnaces himself fled quickly back to the Bosporus, where he managed to assemble a small force of Scythian and Sarmatian troops, with which he was able to gain control of a few cities; however, a former governor of his, Asandar, attacked his forces and killed him. The historian Appian states that Pharnaces died in battle; Dio Cassius says Pharnaces was captured and then killed. Caesar returned to Rome to deal with several mutinous legions. While Caesar had been in Egypt installing Cleopatra as Queen, four of his veteran legions encamped outside of Rome under the command of Mark Antony. The legions were waiting for their discharges and the bonus pay Caesar had promised them before the battle of Pharsalus. As Caesar lingered in Egypt, the situation quickly deteriorated. Antony lost control of the troops and they began looting estates south of the capital. Several delegations of diplomats were dispatched to try to quell the mutiny. Nothing worked and the mutineers continued to call for their discharges and back pay. After several months, Caesar finally arrived to address the legions in person. Caesar knew he needed these legions to deal with Pompey's supporters in north Africa, who had mustered 14 legions of their own. Caesar also knew that he did not have the funds to give the soldiers their back pay, much less the money needed to induce them to reenlist for the north African campaign. When Caesar approached the speaker's dais, a hush fell over the mutinous soldiers. Most were embarrassed by their role in the mutiny in Caesar's presence. Caesar asked the troops what they wanted with his cold voice. Ashamed to demand money, the men began to call out for their discharge. Caesar bluntly addressed them as "citizens" instead of "soldiers," a tacit indication that they had already discharged themselves by virtue of their disloyalty. He went on to tell them that they would all be discharged immediately. He said he would pay them the money he owed them after he won the north African campaign with other legions. The soldiers were shocked. They had been through 15 years of war with Caesar and they had become fiercely loyal to him in the process. It had never occurred to them that Caesar did not need them. The soldiers' resistance collapsed. They crowded the dais and begged to be taken to north Africa. Caesar feigned indignation and then allowed himself to be won over. When he announced that he would suffer to bring them along, a huge cheer arose from the assembled troops. Through this reverse psychology, Caesar reenlisted four enthusiastic veteran legions to invade north Africa without spending a single sesterce. Caesar quickly gained a significant victory at Thapsus in 46 BC over the forces of Metellus Scipio, Cato the Younger and Juba. Nevertheless, Pompey's sons Gnaeus Pompeius and Sextus Pompeius, together with Titus Labienus (Caesar's former propraetorian legate (legatus propraetore) and second in command in the Gallic War) escaped to Hispania. Caesar gave chase and defeated the last remnants of opposition in the Battle of Munda in March 45 BC. During this time, Caesar was elected to his third and fourth terms as consul in 46 BC (with Marcus Aemilius Lepidus) and 45 BC. Caesar was later proclaimed dictator first for ten years and then in perpetuity. The latter arrangement in openly doing away with a term limit, triggered the conspiracy leading to his assassination on the Ides of March in 44 BC out of such fears. Following this, Antony and Caesar's adopted son Octavius (later Caesar Augustus) had to fight yet another civil war against remnants of the Optimates and Liberatores faction, but they were crushed by the skill of Marcus Antonius, who was able to defeat his two main opponents, and Octavius, despite having his camp overrun, evaded capture. Αναρτήθηκε από ΕΛΛΗΝΙΚΗ ΙΣΤΟΡΙΑ ΚΑΙ ΠΡΟΙΣΤΟΡΙΑ - GREEK HISTORY στις 3/26/2016 06:09:00 μ.μ.